Kirk Douglas was born Issur Danielovitch Demsky. 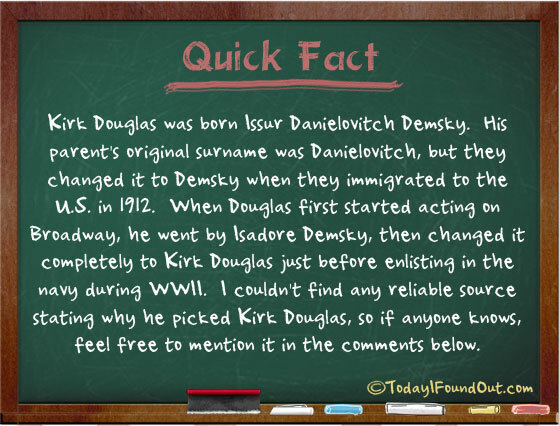 His parent’s original surname was Danielovitch, but they changed it to Demsky when they immigrated to the U.S. in 1912. When Douglas first started acting on Broadway, he went by Isadore Demsky, then changed it completely to Kirk Douglas just before enlisting in the navy during WWII. I couldn’t find any reliable source stating why he picked Kirk Douglas, so if anyone knows, feel free to mention it in the comments below. claims he wrote a paper on Issur while in college and refrained from using that long name, just entitled the report as KIRK. I found this out on the phone today and Larry can hardly hear so I was having trouble questioning him on the KIRK name and timing. He did say that he has a copy in his scrap book which he will show me on Thursday. If he did in fact pen the Kirk name on Issur then he had a part in naming my son as we named him Kirk after seeing Sparticus! I’ll let you know what I find out!